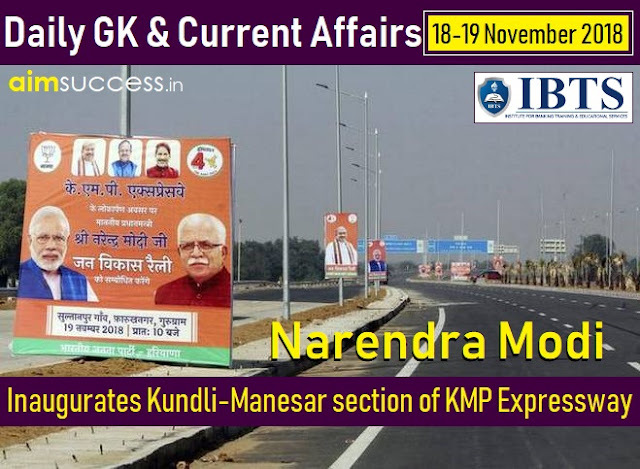 Prime Minister Narendra Modi has inaugurated the Kundli-Manesar section of the Kundli-Manesar-Palwal (KMP) western peripheral expressway. The 136-kilometre long six-lane expressway built at a cost of over 6400 crore rupees. Mr Modi also inaugurated 3.2 km-long Ballabhgarh-Mujesar Metro rail link for the people of Delhi and Faridabad. After Faridabad, Bahadurgarh and Gurugram, Ballabhgarh will be the fourth city in Haryana to be connected by metro (now total length 29 kilometres in the state). He also laid the foundation stone for Shri Vishwakarma Skill University that is to come up at Dudhola in Palwal district of Haryana. As part of his two-nation visit (Vietnam and Australia), President Ram Nath Kovind reached Hanoi the capital of Vietnam. Indian President will address delegation of Vietnam India business forum and the Indian business community. India and Vietnam have robust trade and economic relations with bilateral trade of 12.8 billion US dollars. The AYUSH Ministry is celebrating its first Naturopathy Day across the country. The Central Council for Research in Yoga and Naturopathy is organising health camps, workshops and exhibitions in association with local naturopathy centres and hospitals. More than 1,000 Naturopathy specialist doctors from all over the country participated in the event, which was organised by International Naturopathy Organisation in association with Ministry of Ayush. Work on building natural clinics is already in progress in Pune, Goa, Delhi, Haryana, Karnataka, Kerala and Andhra Pradesh. The two-days 8th National Conference of Women in Police (NCWP) has begun in Ranchi, Jharkhand. The conference is being organized by Bureau of Police Research & Development in collaboration with Jharkhand Police. It is the only national-level platform to address the issues of Women in uniform and create an enabling atmosphere for them to maximize and optimize their professional potential. NCWP has been continuously working on strengthening and monitoring of mechanism to deal with sexual harassment in all the Police Organizations / CPOs by suggesting active ways and means. The Centre for Science and Environment (CSE) has won 2018 Indira Gandhi Prize for Peace, Disarmament and Development. The last two recipients have been the UN High Commission for Refugees (UNHCR) and Former prime minister Manmohan Singh. The Indira Gandhi Prize is the prestigious award accorded annually by Indira Gandhi Memorial Trust to individuals or organisations in recognition of creative efforts toward promoting international peace, development and a new international economic order. Indira Gandhi peace prize conferred by Indira Gandhi Trust each year on the late Prime Minister's birth anniversary. Senior IRS officer Sanjay Kumar Mishra has been appointed as the full-time chief of the Enforcement Directorate (ED) for two-years. He replaced current ED director Karnal Singh’s whose term ended on 25th Oct 2018. Mr Mishra, a 1984-batch Indian Revenue Service (IRS) officer of the Income Tax cadre. The ED enforces two major laws in the country to check black money — the criminal Prevention of Money Laundering Act and the Foreign Exchange Management Act. The World Toilet Day is observed across the world on 19th November with an aim to motivate millions across the world on issues of sanitation. The theme for 2018 is ‘Nature-based solutions’. The day is about inspiring action to tackle the global sanitation crisis. United Nations' Sustainable Development Goal 6 (SDG 6) aims to ensure availability and sustainable management of sanitation and water for all by 2030. In 2013, the United Nations General Assembly officially designated 19th November as World Toilet Day. World Toilet Day is coordinated by UN-Water in collaboration with governments and partners. The Quami Ekta Week (National Integration Week) is being observed across the country from the 19th to 25th November 2018. The week is observed to highlight the strength and resilience of the nation to withstand any potential threats to the secular fabric. These occasions will also provide an opportunity to reaffirm age-old traditions and faith in the values of tolerance, co-existence, and brotherhood in a multi-cultural and multi-religious society. 21st Nov Linguistic Harmony Day. Maha Vir Chakra awardee Brigadier Kuldip Singh Chandpuri (retd) (78-year) passed away in a private hospital in Mohali in Punjab. Mr Chandpuri is known as the hero of the historic 1971 battle of Longewala. The battle of Longewala (1971) was one of the first major engagements in the western sector during the Indo-Pak war of 1971, fought between assaulting Pakistani forces and Indian defenders at the Indian border post of Longewala in the Thar desert of Rajasthan. India's Manav Thakkar settled for a bronze medal in the Under-21 singles category in the International Table Tennis Federation Challenge Belgosstrakh Belarus Open in Minsk, Belarus. Manav lost to Russia's Denis Ivonin in the semifinals to miss out on the gold. Australia's biggest stadium Melbourne Cricket Ground (MCG) will host the final match of both the men's and women's World Twenty20 cricket in 2020. The women's World T20 will run from 21st February to 8th March 2020. The men's tournament will be held from 18th October to 15th November 2020 in Australia. The eight host cities will be Adelaide, Brisbane, Canberra, Geelong, Hobart, Melbourne, Perth and Sydney. The Melbourne Cricket Ground (MCG) is an Australian sports stadium located in Yarra Park, Melbourne, Victoria. The MCG is listed on the Victorian Heritage Register and was included on the Australian National Heritage List in 2005.